I had the privilege of collecting a full van of new school clothes from Blue Max Banner. These clothes are perfectly fine to wear but may have something wrong with the embroidery. 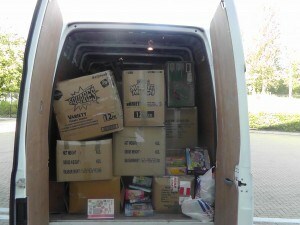 We are so grateful for this donation and will ensure they get to the children that need them most. The first load will go to Pencott Valley School in Nabigyo Slum in the next couple of weeks. I also collected a number of boxes of new baby clothes from Sue Miller. Thank you Sue. People have been so generous and we are seeing a massive increase in ‘In Kind’ giving. (This is companies giving a product rather than money). We are really excited about this and our storage at Big Yellow is now packed ceiling to floor and right up to the door. We would like to get to a place where we have free storage and a permanent transport solution. Any ideas, suggestions or contacts would be gratefully accepted.